There’s nothing revolutionary about crumbing a pork chop and frying it, which is, I suppose, why it’s so comforting both to cook and to eat. It is, however, something of a rebellion against food fashion – meat, butter, cheese, frying – although I have to confess that in my mind that only gives it bonus points. I don’t cook like this all the time, and I’m unapologetic when I do because it really is one of the best ways to cook good pork. This technique works fine with thinner chops, anywhere up to about 1cm (about ½ inch) thick. 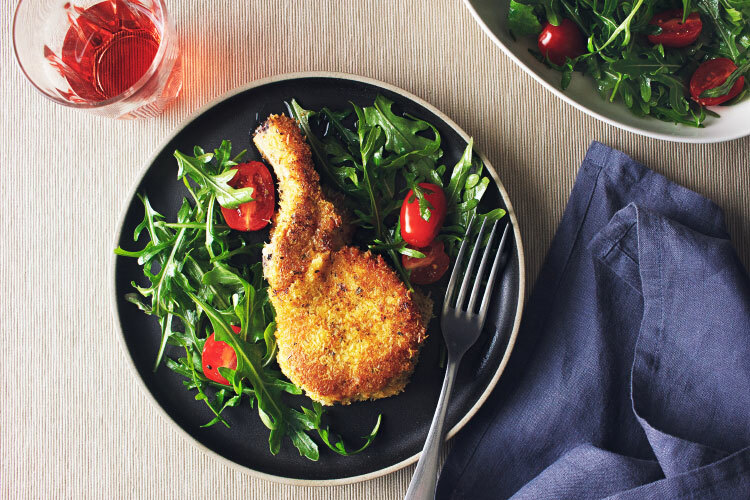 For thicker chops, or chops which are still fridge-cold when you cook them, you’ll end up with the crumb coating being browned before the meat is cooked through. You could just pound them thinner, but that takes all of the fun out of a gorgeously thick rib chop. The way to deal with it is to have your oven set to 200°C (400°F), pan-fry the chops and transfer them to a baking tray. Put it in the oven for 5 minutes (obviously, longer for very thick chops) and check for doneness: it won’t colour the crumb coating much more, but it will ensure that the meat is cooked through properly. Get out two wide, shallow bowls – I use a couple of sandwich cake tins. Break the egg into one, and whisk in some salt and pepper to season. In the second bowl, combine the panko, parmesan and oregano. Place a cutlet in the egg mixture and turn to coat. Transfer to the panko mixture and cover with crumbs, pressing lightly as you go. Transfer to a plate. Repeat with the second cutlet. You can, if you like, repeat the process to double-coat the cutlets for super crunchiness. Once the butter has foamed up in the pan, cook the cutlets for 4 minutes a side until the outside is golden and the meat is cooked through.